In the back Eliza Harenwood was preparing for her latest match. The dancing passion hadn't been sighted for quite a while, the British lady took a leave of absence to spend time back home. Eliza was of course eagerly anticipating her return back to Tension, it was indeed a thing that the fans wanted. Their beloved girl that clashed against both men and women and displayed her prowess, Eliza had of course kept her practise up. Her private locker room door was knocked on, informing the British lady that it was now time to make her way to the ring. Eliza smiled, she had just finished getting herself prepped for the match. Her opponent tonight was called Chloe Mason. It was actually a name Ms Harenwood heard by reputation, a fighter similar to Eliza in a few ways. Eliza found this one to be quite interesting, very few battled like Eliza did. Instantly the well known song called Baile de batalla began to blast from the speakers. The crowd quickly began cheering loudly, the tunes of Spanish guitars mixed with dubstep could only signal the arrival of Eliza Harenwood. Sure enough the lovely Brit would grace the arena once again, Eliza waved regally at the crowd. Oh she loved them all. The dancing passion strode boldly towards the ring, gladhanding the fans and taking a selfie with one. Since she had stepped foot in Tension, many of the fans had wondered on the potential matchups that could be made, seeing as Chloe made quite the impression in her last match. Friction was technically her home but Tension is perhaps where she should be in her mind. While many had been surprised at a small woman indeed taking on someone bigger than she is, it wasn't her first rodeo. Heck, she was a commissioner for an intergender wrestling federation. Her heart wondered if she will get her chance to grace the Tension ring once more. Luckily, the higher-ups had brought Chloe to another match this year. And it is against someone that she had her sights on for a long time. No, it was Eliza Harrenwood. The Darling of Tension. After seeing one of her secretaries taking her on, she immediately took interest to the Brit. Very few had come close to matching her own unorthodox style, Eliza perhaps being the only one coming close. 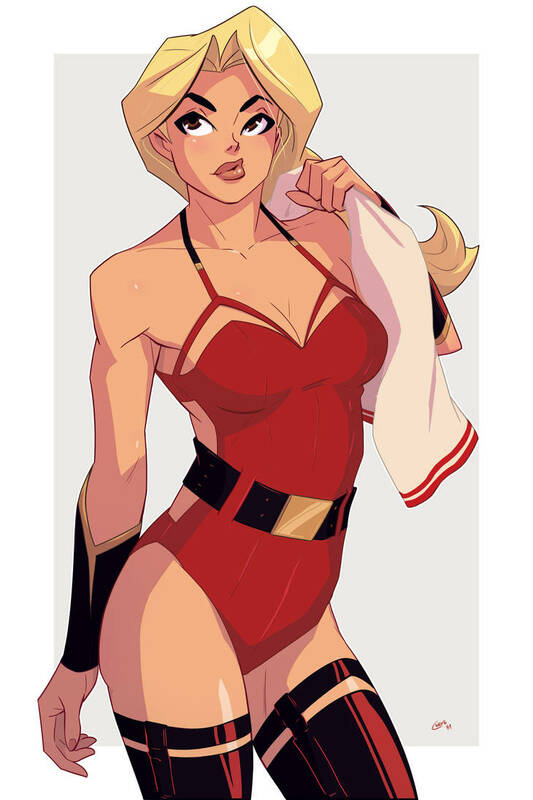 While not the excat same as the former commissioner, she is also known for her lethal legs that had caused trouble for her opponent. Man or Woman. And that was another thing that had caught her. For someone who would have been a good fit for Friction. she has held her own and even making a great record too, climbing the ranks as perhaps one of the bests Tension has to offer. To say Chloe was excited would be the understatement of the year. And this year has already started. Eliza wasn't the only one that came out differently. Chloe Mason was indeed the next to come out, though most would certainly pick out the many differences. First, the usual goons that she would come out with had been ditched entirely and instead of coming out on her lonesome. Which would bring the reason as to how she would take off her heels that she usually comes out with. Except that she didn't come out with heels, like Eliza, her legs covered in some interesting red stockings that are dressed over the simple fishnets. In fact, her whole attire is very different, perhaps looking more of a wrestler than before. The crowd excited in her debut look, especially in Tension, the blonde climbed up on top of the ring apron before posing between the ropes, kicking her leg high. Most knowing how brutal they could be and Chloe was more than excited to see how they compare to Ms Harenwood's well known 'rapiers'. Finally entering inside, Chloe doesn't go to her corner, but instead, opted to get a closer look at her opponent. Walking up towards the Darling of Tension, Chloe lifted her right leg up before letting her ankle rest on the top rope. Something that Eliza herself has been known to do, most linking it as perhaps a means to get into Eliza's head. "The Darling of Tension. We finally meet." Chloe finally spoke, not once breaking eye contact. "I'm definitely looking forward to this..."
Well it was time......Eliza had heard tales of Ms Mason. It had always been on Eliza's list to see about going head to head with this woman, a very similar appearance as well as style to the British woman. Ms Harenwood faced a wide array of different opponents with styles, but she'd never had the chance to duel someone with a similar form of battle to herself. Eliza waited patiently for Chloe to arrive, the dancing passion looked at the entrance ramp. Sure enough Ms Mason proceeded to make her way to the ring, Eliza heard stories about her entrances. Akin to Eliza it seemed this woman was taking this seriously, entering alone and ready for the occasion. Good, Eliza respected this woman's outlook. Eliza smiled politely as the opponent prepared to get into the ring, inside her heart already pounded rapidly. A sign that this would indeed be a difficult and exciting bout, already the fans were eager to see these two square off. And Ms Harenwood couldn't agree more. When Chloe entered the ring Eliza was expecting her to go to the corner and prepare for the ensuing bout, instead though Ms Mason went close to Eliza and raised her leg onto the top rope in a very similar manner to Eliza. Some might have taken offence, but Eliza instead gave a chuckle and said "Hmmmmm yes indeed. Ms Mason we finally cross paths, I've been curious and eager to test myself against one such as you. Let us give our all and make history yes?" Eliza was looking forward to this as equally as Chloe. Eliza had performed all her routines beforehand, once Chloe made her way back to the corner Eliza would settle into her stance. Primed and ready for battle. It was perhaps very cheeky of Chloe to do that, something that Eliza has been known to do as her own leg rested on the ropes, right in the face of Ms Harenwood. One would see it as disrespectful but it was all good fun, the former Commissioner still showing that she is indeed quite evenly matched for Eliza. Chloe though just wanted to see her up close and personal, getting a good look at the Darling of Tension, before the bell would eventually ring. She was indeed curious. Her body was similar to the fellow blonde, albeit a tad shorter, and yet she's pretty famous for taking on and more often than not, beating opponents bigger than she is. The only style that would come close to comparing Eliza's would probably be Capoeira, the way dance is used to hide a deadly style. It was indeed very unique to Chloe and it was one of the reasons why she was more excited about this match. She could observe as much as she wanted, although she wouldn't forget that this is a match nonetheless. Letting her leg fall down from the ropes slowly, not even breaking eye contact as the two trade compliments, showing off her own balance. "Well I'm glad someone like you is very eager to test a woman like myself." She gave a light chuckle. "I've been looking forward to seeing your style up close. So I very much expect you to give your all." Taking a step back as she retreats to her corner, for now, awaiting the bell. "I'm sure you don't wish to end up like my past opponents..." A little remark thrown before she would turn and face the referee, her heart pounding with such excitement that she could barely contain any longer! Soon the bell would indeed ring, the crowd giving a big cheer as Chloe steps in towards the direction of the Dancing Passion. No step was wasted, being careful in the first few seconds that have passed in this match! Eliza was feeling like in a different time she and Chloe could have actually made a pretty good team together, given their apparent similarities and appearances. Though Eliza wouldn't be opposed to the idea following this either, for now Eliza was intent on bringing her full might to bare against this opponent. Ms Harenwood felt as though history was being made, it was said that those who do make it often don't realise it while they do so. Eliza disagreed. She knew damn well that this would be looked back on by fans in a highlight reel. She was taking this fully seriously, the dancing passion lightly cracked her neck. Chloe made her remarks, Eliza usually didn't partake in this sort of communication. Preferring to allow for her actions to speak for her, but still Ms Harenwood would indulge in this. The French Brit said "I am sure you will be impressed Ms Mason, I hear your formidable also." Eliza couldn't help but smile in this conversation as the anticipation was driving Eliza forward. At Chloe's last remark Eliza simply responded with "Mhm certainly, but I don't think either of us will be left standing after all of this." Ms Harenwood knew this to be true, both these two were going to be put through the ringer by the end of it. A little pre-fight banter wouldn't hurt much. And considering how out of the ordinary it was for those two since coming into the ring, it was good to see how Eliza would handle it. To her surprise, Eliza indulged in it more. Reassurance that she will be impressed and that either of them would be left standing. An eyebrow cocked up once she heard that. But soon smiled back. Even though she liked the Dancing Passion, she came into this match with the intention of winning and besting her foe. Admiration is all well and good but now it was time to let actions speak all the more louder. Chloe was perhaps more curious as to how Eliza would start her offence. Like most of her matches, she made s habit to look into her past matches and see her strengths and weaknesses. Always an analytical mind, Chloe had certain expectations coming into the match, though with how differently things were, there might be an inkling of change coming to play. Which was made more apparent once the Darling of Tension came on Chloe, her leg swinging out. Okay, that seems usual. Except it swung low. That wasn't usual. Cause fights before wouldn't pin her as the type to strike 'below the belt'. But... perhaps with the two being pretty similar in terms of fighting style, Eliza seemed to be opting for a shift in offense. Chloe saw that with Dmitri, albeit he changed halfway into the match. Now she was seeing it with Eliza. The kick would turn to be a feint, which Chloe saw to react to by raising her leg up to defend it. The real attack would come in a form of a palm strike which aimed at Chloe's chest. Very interesting. She didn't have much time to catch that hand, much as she wanted to. But there was enough for Chloe to use her own palm to smack at the outer side of her wrist and knock it askew. Although it did just graze her shoulder. Since Eliza didn't start off with a kick, Chloe might as well do. With her left leg already raised, Chloe shot out a front kick. Simple enough. Toes flexed back, she would target right underneath the ribcage of the Dancing Passion and perhaps push her away back. Eliza was prior to this wondering, perhaps she could get the aid of Chloe if either needed a partner for a match. It was crazy, but it could be an ideal pairing. For now Eliza would use this as the sizing up, the sales pitch. Eliza wanted this to be a battle for the ages, to be engraved in history. Ms Harenwood entered in with a size up, trying something alternative to her usual MO. To see how Chloe could cope with a change in what the usual assumptions of Eliza could be. After all it wouldn't do to reveal your opening hand too quickly against a foe with such an explosive offence similar to your own, hence the more conservative approach. At first it seemed to reveal fruit. But Chloe was quick on the draw, Eliza landed more of a glancing strike. Which was then followed by a swift kick, Eliza on instinct reacted to it, shuffling herself around to try and lessen the blow. Roll with the punches as they say, but the sudden force of it jarred the dancing passion. Sending her careening back, unfortunate. Chloe struck the first proper blow, it was odd. Many a time Eliza claimed credit in that department. "Ghn, impressive....." Eliza muttered. Chloe was quite surprised that Eliza didn't come in with her usual MO. Instead, she was coming in with something different. Chloe couldn't fault that, a change of strategy is a good idea against someone like her. And considering the near similarities of their respective styles, any plan against Eliza would essentially be a plan against herself. Chloe more acted on instinct, true to herself coming into this. The Dancing Passion no doubt wanted to bout with the fellow blonde for a long time and would want this to be engraved in history. So if Eliza wanted Chloe Mason, she was getting Chloe Mason. So far the match seemed far from deja vu somewhat. Not only did Chloe did the same pose that Eliza did before the bell, but Chloe also got the first attack before Eliza would. And it was a kick too. Granted, not the same as Eliza's usual but a kick nonetheless and had her careening backwards. Though Chloe knew she was far from done. This was the first attack after all. And she had more where they had come from. The Darling of Tension would come back with a rally of her own. This time something that the crowd had seen many of times before. Now she was being herself, Chloe seeing first hand the brief yellow and red tornado coming towards her before the kick would actually come out. A smile crept up. This was the Eliza she wanted to see. And the Eliza she was more prepared for. Unlike the palm strike which she didn't expect, Chloe was more ready for something like this having watched many of her matches before. The former commissioner would lean to her left, though of course, that wouldn't really be enough. One hand would soon be planted to the canvas before cartwheeling her petite self around, just to narrowly miss the foot that came out with blinding speed. An interesting way for evasion, though as Chloe would return to standing position, she would spin herself, her left leg swinging upwards and looking to clock the Briton with an outer spinning crescent kick, the blade of her own stocking clad foot looking to strike the Dancing Passion to perhaps her own favourite target, as well as her's: her head. Eliza had scarcely faced one who employed similar strikes such as herself, hence why she tried to change it up in the hopes that Eliza doing so could catch her foe off guard and win the initiative. Against a foe such as Chloe every possible chance mattered, Ms Harenwood needed to perform at no less than her best if she wanted to obtain victory. Yet the beginning seemed to be going awry right off the bat, almost as if Eliza wasn't at her peak performance. Which for an event like this Eliza undoubtedly believed. Perhaps it was this notion that led to the dancing passion reverting back into her legendary leg attacks, to smack Chloe so hard that she would be unsettled. Only that wasn't the case, likely due to their similar natures Chloe was able to do what few before could do against Eliza. Read her attack, so easily in fact that it made the dancing passion look like a child in comparison. Eliza felt her attack catch nothing but thin air, though Ms Harenwood quickly managed to get back into a proper stance. Just in time to see that Chloe had attempted an attack out the corner of her eye, Eliza's reflexes quickly came into play. Eliza just managed to get her guard up, protecting her head form the attack. The sheer force of the impact sent Eliza staggering back however, Ms Harenwood felt herself skidding backwards. First her opening gambit failed to produce fruit and now she was forced onto the defence, blast this woman! While it wasn't a clean hit as she had hoped, Chloe inwardly felt satisfaction in seeing Eliza, one who would usually be on an explosive offence already, being forced on the defensive by her own attack. The crowd undoubtedly surprised by the change of events. Good. She wanted them and Eliza to know that this wasn't going down like her usual bouts. And Chloe was glad that she was giving this newfound challenge to the Dancing Passion. Though that is not to say that Eliza wasn't forcing Chloe to up her game. Chloe did want Eliza to impress her. She really did. But she wasn't going to make it easier for her. And neither was she going to stand there, Chloe coming into this battle with the hopes of being the victor over the Darling of Tension and to have the fellow blonde underneath her sole. Thoughts aside, Chloe smiled. Part impressed that Eliza blocked that but also smiling that she has her skidding backwards. Take them out of their game and make them play your game. While she may not have been in the ring as long as Eliza, her own wit and experience from being in the wrestling business were going to be used to the fullest. The former commissioner would follow the dancer as she skids backwards. There was one thing she wanted to try and this might be a good time to do so. Chloe stepped in with her left foot before the right leg would rise up high. From the way it comes up, it looks to be a simple front kick again, especially with her toes flexed backwards and splayed. The difference, however, came when her right foot twisted outwards, the kick coming at an interesting angle, all with the intent to hopefully smash the ball of her foot right on the right cheekbone of Eliza. Wondering how Eliza would react to an unorthodox kick.